Rose and Rick Powdrell. Photo: Bay of Plenty Ballance Farm Environment Awards. And since they first took ownership of a large part of the farm in 1986. They’ve gradually transformed the 446ha – with 382ha effective – into a diverse drystock operation with environmentalism at its core. “My Grandfather Jack bought the property in 1939. Both Jack and my father John were forward-thinkers,” says Rick. “They did some great things which have benefited the land, such as fencing off steep gullies and gorges. This has seen the Powdrells fence off significant waterways – unusually that form most of the property’s boundary – and plant thousands of trees for the benefit of their own property and the greater Kaituna catchment. Rick has also worked with BOPRC on biological controls. In the 1980s he established a receptacle weevil to help control nodding thistles; in the 1990s the BOPRC established a gall fly to curb the same thistle. And he says any natural organism that can assist in producing a better environmental outcome than the spray alternative “is a win for me”. Involved with Federated Farmers for a long time – he’s served as BOP Provincial president and Federated Farmers meat and fibre industry group chairperson – Rick says it wasn’t until he was elected to the board that he really got involved in the politics of environment. “This focused me to look at my own property and say: ‘What are the environmental issues we’ve got and let’s focus on those’. The three-year project’s goal was to highlight on-farm environmental work being done, how to go about it and how farmers can involve local bodies. Drilling for water and installing troughs is an expensive exercise, but takes stock away from natural waterways where they muddy the edges and dirty water to the detriment of downstream ecosystems. Other work has included planting poplar poles and Manuka seedlings, and installing detention dams to alleviate washing out in gullies. The Powdrells did a Level 3 Environment Plan as a focus farm. “It was a five-year plan so we’re still working through that.” The focus for the next three years is on fencing off gullies, wetlands and now-redundant dams once used for stock water. The beef operation currently has 130 brought-in 100kg beef calves, 77 one-year beef steers and 23 one-year beef heifers, 50 two-year beef steers being finished now – predominantly of Simmental and Hereford and Friesian-cross breeds. Plus, 170 dairy heifers and 170 dairy calves. 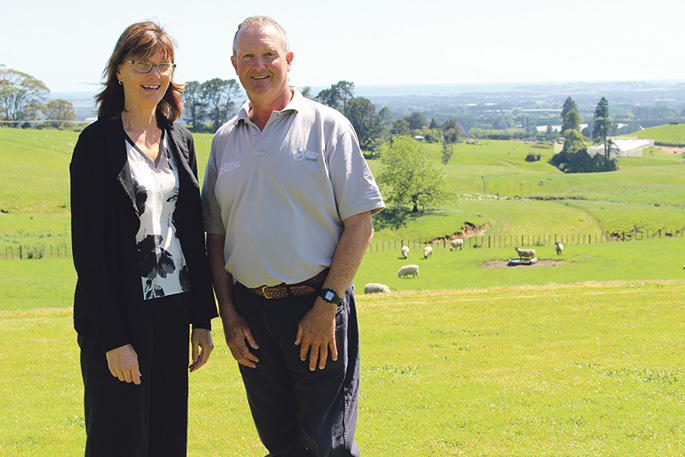 “One of our big drivers has always been diversity of our operation, which includes our sheep, dairy grazing and beef and amongst the sheep you’ve got prime lambs, mutton, and wool. “I’ve always had a philosophy that if I’m going to have wool on a sheep I’m going to try and grow a good as a fleece as I can,” says Rick. “We certainly want the property to be as good – and hopefully better – environmentally and more sustainable when we leave it than when we came.